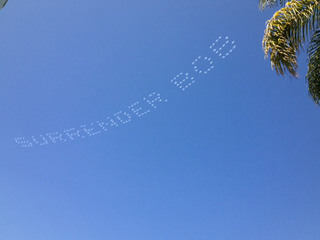 A San Diego radio station put this up as their message to Bob Filner. Yeah, every week is a crazy one in the rough and tumble world of politics. This is a roundup of some of the fun pundits had watching their favorite sport. You can read that here. Conservative columnist Bill Crystal knows what Sarah Palin needs to do to get her gravitas back (did she ever have any?). She needs to run for the Senate! Yes, he thinks she should run against incumbent Democrat Mark Begich in Alaska next year. Now, I would like to see a Palin Senate campaign because it would be hilarious. I write satire and it would be a gift from the heavens for me (oh, Christine “I am not a witch” O’Donnell, please run for something else, we miss you!) but I don’t think she has the stomach for real policy. Quitting her day job ten minutes after she lost in 2008 made that pretty clear. She doesn’t want to make a difference, she wants to make money. This is a near fail because it’s never going to happen. When Liz Cheney moved back to Wyoming to run for the Senate (challenging another non-liberal, Mike Enzi) she did what she thought she should do — get a fishing license. The problem? You need to be in the area at least a year to get one legally so she lied on her application. She paid a fine but blamed the clerk for making the mistake (her application said she had been a Wyoming resident for 10 years). Enzi is ahead in the polls and apparently, Wyoming residents take this kind of thing seriously. Take home message: don’t lie on your permit applications. Read more here. It’s not all bad. This isn’t a political story but a win nonetheless. Antoinette Tuff’s quick thinking saved the day when a gunman entered a school in Georgia. This could have been Sandy Hook all over again but it wasn’t. This entry was posted in Stand-up, The stories I tell and tagged alaska, bob filner, campaign 2014, chris christie, Georgia, Mark Begich, Mike Enzi, New Jersey, San Diego, Sandy Hook, sarah palin, senate, Steve Lonegan, Wyoming on August 24, 2013 by Alyson Chadwick. It’s true. Check it out here. This entry was posted in Political thoughts and tagged barack obama, Executive order, iowa, Republican, Ronald Reagan, senate, Steve King, United States Senate on June 14, 2013 by Alyson Chadwick. What do the Boston bombings have in common with immigration reform? Nothing. Wrote more about that here. This entry was posted in Random and tagged Boston, Chuck Grassley, Grassley, iowa, Patrick Leahy, senate, United States, United States Senate Committee on the Judiciary on April 21, 2013 by Alyson Chadwick. Gosh, I wish the Senate would grow a pair. This entry was posted in Uncategorized and tagged Background check, Chuck Todd, Flake, John F. Kennedy, senate, United States, United States Senate, Wayne LaPierre on April 17, 2013 by Alyson Chadwick.